The best mattress for back pain? It depends! When it comes to bedtime, we don’t all sleep the same way. Although there are many different sleeping positions, they can be categorised into 4 general types. Generally speaking, you will sleep on your back, front or side; or in the fetal position. Each of these different ways of sleeping has their different pros and cons, but your sleeping style is so habitual, that you are unlikely to be able to change it. As an alternative, you should be seeking out a mattress (or mattress topper) that will suit the position you have a tendency to adopt. The majority of people sleep on their side, either in the fetal of the log position. The issue here is that it can cause the hips and shoulders to take the strain. This is because there is often a gap formed between the body and the mattress. In this instance, you need a mattress that will form a cradle to fill the gap. Ideally, you will need a soft and thick comfort layer (approx. 3 inches) that will allow your body to sink into the mattress. For those of you that sleep on your back, the good news is, that this is often considered to be the best position. 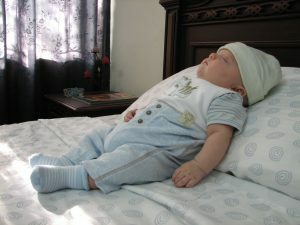 Most of the body is supported, and if you can avoid snoring or sleep apnea it is a healthy position. The only slight downside is that it can create a slight gap between the mattress and the lumbar part of the spine. In this instance a thinner (2-inch) topper is advisable. Sleeping on your front is possibly the most problematic position. Particularly as the head is normally twisted and could put unnecessary pressure on the neck. If you do use a comfort layer, a firm thin option is best. What properties does the mattress need to have? It is important that you get a mattress that will follow the contours of your body as you sleep. It needs to be firm enough to offer support, but should not be overly firm. One of the best mattress types for back pain relief is a high-quality memory foam. They come with different levels of density that can account for the different sleeping positions that we referred to previously. Memory foam is the best at keeping the spine in alignment. This helps prevent back pain and discomfort in general by providing the necessary lumbar support. Of course, whilst a good mattress can certainly help, for the longer-term relief of chronic back pain, it is worth seeking the help of a qualified practitioner.